This comprehensive online calculator not only calculates the amazing time and interest savings from paying off your debts using the snowball method (instead of the bend over method), but also gives you 60 ideas to jet propel the process. You can even choose and compare between 8 different payoff order options. The printer friendly report includes your debt list, your booster rocket list, and your rollover plan payment schedule. Select the month and year you would like to begin your get out of debt plan. Optional: Enter an amount you feel you could add to your G.O.O.D. plan on a monthly basis. Enter as a dollar amount, but without the dollar sign and any commas. Optional: Enter a one-time amount you feel you could add to your G.O.O.D. plan upfront. Enter as a dollar amount, but without the dollar sign and any commas. Choose the order in which you would like to pay off your debts. You can change the order at any time, in which case any entered debts will be resorted and your plan will be recalculated. To add a debt, enter the name and associated variables and then tap the "Calculate Stats" button. When you're satisfied with the entries, tap the &plus; button (may also appear as "Add" or "Add Debt" depending on the width of your device). To edit a debt in the list, select the debt from the debt list menu. This will load the debt into the form for editing. When you're satisfied with the changes you've made, tap the "Calculate Stats" button and then tap the S button (may also appear as "Save" or "Save Changes" depending on the width of your device). To delete a debt from the list, select the debt from the debt list menu. This will load the debt into the form for deleting. Tap the − button (may also appear as "Delete" depending on the width of your device). To clear the form to create a new debt entry, tap the C button (may also appear as "Clr" or "Clear" depending on the width of your device). Important! The entered debts are saved in your device's random memory (temporary storage), which means that if you surf to another calculator or close this browser window you will need to re-enter your debts. Each entered debt will appear in this menu as you enter them, sorted by your pay off order preference. Changing your pay off order preference in the top section of the calculator will automatically re-sort the debts listed in the menu. To edit or delete an entered debt, select the debt from the menu and the calculator will load the debt's saved variables into the appropriate fields below this line. You can then either edit and save the changes, or you can delete the debt from your list. Enter the name of the creditor as you want it to appear on the printed reports. Enter the principal balance of the debt, without any dollar sign or commas. Note that this is not equal to the number of payments left times the payment amount -- because that would include interest charges you don't yet owe. What you want to enter here is how much cash it would take to pay off the debt today (call your creditor if you're not sure). Enter the annual interest rate of the debt. Enter as a percentage without the percent sign (for .06 or 6%, enter 6). If this debt has more than one interest rate (1 for purchases and 1 for cash advances), enter the higher of the two. It's always best to use worse-case scenarios. Enter the monthly payment for the debt, without the dollar sign or commas. If you are including your mortgage in the rapid debt reduction plan, be sure to only enter the principal and interest portion of your mortgage payment (leave out the portion for taxes and insurance). If you make the same payment amount each month, select Fixed. If you only make the minimum payment amount, and the payment amount keeps getting smaller each month, select Declining. Optional: If you would like to determine your own custom payoff order, enter a number in this field. If you leave the field blank the calculator will number the debt for you. Once you have completed the preceding fields for the debt, tap this button to calculate the interest cost and number of payments remaining. Both of the calculated fields are required before the calculator will add your debt to the list. Based on your principal, interest rate and payment amount entries, this is how much interest you will pay on this debt between now and when you make the final payment. Based on your principal, interest rate and payment amount entries, this field will display the number of monthly payments remaining on the debt. To add (or edit) a booster rocket, select the booster from the list, enter the amount you will save (without dollar sign and commas) and select corresponding period, and then tap the Save button. The calculator will automatically translate the amount to monthly and add it to the monthly booster total. Note that the Clear button simply clears the booster form and does not zero out the amounts, whereas the Clear All button clears all previously entered booster amounts. The calculator will automatically total up your monthly booster rocket amounts as you save them. This section will display the time and money savings your G.O.O.D. plan will save over simply paying of your debts as originally prescribed. The section will also display a summary, a comparison chart, and a button for creating a printer friendly report. Note that this section will update as you make changes in the previous sections. This is how many months you will shave off of your debt repayment if you switch from your current method to the rollover method with booster rockets. This is how much interest you will save if you switch from your current method to the rollover method with booster rockets. This free online calculator will calculate how much time and money you could save by paying off your debts using the "rollover" method. 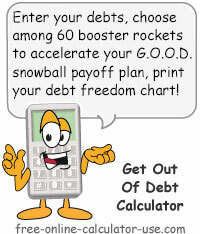 Plus, the calculator will also give you 60 booster rockets that you can strap to your get out of debt (G.O.O.D.) plan. If you have 10 or fewer debts and are not interested in the booster rocket options, please use the simplified Rapid Debt Reduction Calculator instead. The RDRC also includes some important concepts to keep in mind when formulating your rollover or snowball payoff plan. Select the month and year you want to start the plan, enter any monthly and/or one time additions, and select your payoff order preference. For each debt you would like included in your Get Out Of Debt (G.O.O.D.) plan, enter the name, current balance, interest rate, monthly payment, payment type, and optional sort order, and then click the "+" button (may appear as "Add" or "Add Debt", depending on the width of your device). Once you have all of your debts entered, select and enter any booster rockets you want to add to your payoff plan and then scroll down to view the current results. If you wish to print out your completed G.O.O.D. plan, tap the "Printer Friendly Report" button that will appear at the end of the results. In case you're not familiar with the Rollover Method of debt repayment, here it is in a nutshell. As each debt is paid off, that debt's payment amount is then applied to (rolled onto) the next debt, and so on until all debts are paid off. As you will see when you use the G.O.O.D. calculator, the rollover method can save you a ton of money in interest charges, and allow you to get out of debt sooner than you ever thought possible. The Bend Over Method of paying off your debts is where you continue to make just the minimum payment on each debt for years to come. In this case you are basically bending over so the lending institutions can keep giving it to you up the wazoo. If you take an action that results in permanently lowering your monthly expenses by, let's say, $10, that $10 savings will continue to add up each month. After one year you will have saved $120. After 10 years you will have saved $1,200. And so on. But what most people fail to realize is that if you apply that $10 monthly savings to paying off high interest debt, the savings can add up to thousands of dollars of interest savings over time. The G.O.O.D. calculator includes a scrollable list of 60 different ways you can reduce your monthly expenses. When you use these savings to pay off debt, it's like adding booster rockets to your plan. Finally, once you complete your G.O.O.D. plan, be sure to write down your freedom date and the total amount you will be applying to your debts. Then, visit the Debt to Financial Freedom Calculator to see how long it will take to become financially free by investing your freed-up payments.